When you hear that it helps to "listen to your body," it's true. I'm not even kidding you. Your body talks to you on a daily basis, and if you don't believe me, then you're not listening to it. It bubbles, grumbles, flips, and spins. You have to feel it, deeply. There are times your heart tries jumping out of your chest and your brain sits heavy in your head. Once in a while, though, your body does nothing. It's quiet. It's at peace. This is when you know you're doing something right. My gut is the loudest. It throws tantrums and plots revenge against me pretty regularly. Recently, I listened more than usual. I vowed to take care of it in more ways than just cutting things from my diet. I did something better. I added to my diet, and the two things I've added are winning. 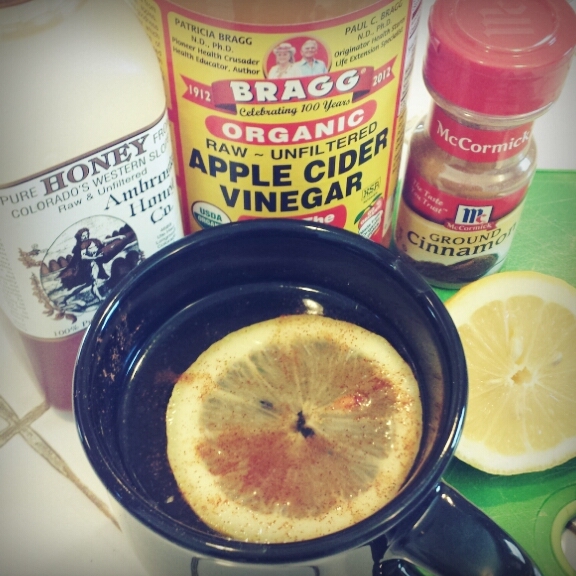 Not only is the ACV helping my skin, but it's aiding digestion and my allergies too! ACV is great for balancing the pH levels in your body, particularly in the afternoons and evenings when we tend to be more acidic. A more alkaline body means less yeast in your gut and a happier you. The article below was a fun read, mostly because I enjoyed the cartoony graph that gives a basic run down of popular foods and their pH levels. The rest is a good read, too, if you want the juicy details: How to Balance Your pH to Heal Your Body. Happiness in a mug. I crave it now. The second thing: Chia seeds. In anything and everything. Drink them in your water. Put them in your oatmeal or smoothies. Throw them on top of spaghetti. Just do it for goodness sake. Talk about regular poops! ;) They're loaded with Omega-3s, fiber, and protein. Read all about them at The Huffington Post: Chia Seed Benefits: 10 Reasons To Add Chia To Your Diet. Yum in a teensy little nugget. I love it. My favorite is putting them in oatmeal. Remember to listen to your body. Feel it. Respect it. And if you just have to have coffee with your breakfast one morning, do it. Just incorporate Happiness in a Mug into your afternoon or evening meal. Please know that only you know your body. So, what works for me might not work for you, but it can't hurt to try. Contact katy@katydaixon.net if you'd like to be added to our schedule of sessions.